Leo F. McNally 88, passed away Sunday, August 13, 2017 at the Adirondack Tri County Nursing Home, in North Creek, NY, after a long illness and a short stay in the nursing home. Leo was born November 25, 1928 in Olmstedville, the son of the late Thomas and Mary Jane Cotter McNally, he was a lifetime resident of Olmstedville. In addition to his parents, Leo was predeceased by his brothers Robert, William and Thomas, his sisters Jane and Elizabeth and his children, Robert and Mary Louise. After graduating from Minerva Central School in 1947, Leo worked for the Town of Minerva installing the Towns first water system (1947-1948). Leo began working for N.L. Industries in Tahawus, NY on January 5, 1948, but was drafted into the US Army on November 20, 1950. Leo served in Germany with a Support Unit until he was Honorably Discharged on November 24, 1952. Leo returned to N.L. Industries, and worked for Thirty-five years, retiring on August 18, 1980. Leo and Effie Jane (Morse) were married on September 29, 1956 in St. Joseph's Church in Olmstedville, NY. 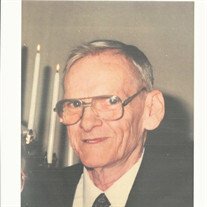 Leo was a member of the Minerva Volunteer Fire Department, he was an avid Mets fan, enjoyed smoking his pipe, ice fishing, and golf, but mostly spending time with his family. Leo is survived by his wife of 60 years, Effie Jane (Morse) McNally; his brother Patrick McNally of Olmstedville; his three sons James McNally of Olmstedville, Daniel (Stacy) McNally of Guilderland, NY, and Peter (Jessica) McNally of Olmstedville; his Grandchildren, Ryan (Kelly), Gabrielle, Zachary, Danielle, Katelin, Robert, Kevin and Briana; and his great granddaughters, Jozy, Emma, and Gemma, along with many nieces and nephews. Per Leo's wishes he was cremated and a private family memorial service will be held at the Butler Cemetery in Olmstedville. In lieu of flowers, the family suggests memorials take the form of donations to St. Joseph's Church or the Minerva Volunteer Fire Department and Rescue Squad.